Over a campfire on a warm August evening friends shared stories, s’mores, and… insights into pressing librarian topics such as the ACRL information literacy framework. 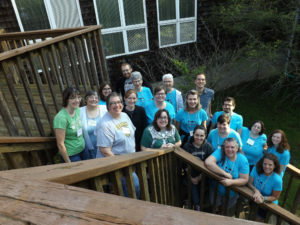 On August 11th and 12th, 2016, 25 librarians employed by member schools of the Private Academic Library Network of Indiana (PALNI) gathered together for a two day camp adventure, supported by the Reference, Instruction and Outreach (RIO) group of PALNI. Camp RIO was held at Merry Lea Environmental Learning Center, a 1,100 acre nature sanctuary located near Goshen College in Northern Indiana. Each session came with pre-readings and reflection time in nature, giving participants a chance to engage in discussion and activities around 3 central themes: library anxiety, evaluating scholarly sources, and work/life balance, as well as the opportunity to attend additional break-out sessions to ponder serendipity in research, assessment, and social media. 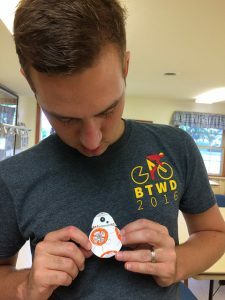 The RIO Coordinators and Steering Committee led the workshop sessions as well as a wide range of camping activities, such as crafts, hiking, and a book club discussion. Different teaching methods were demonstrated, and campers walked away with new practices and approaches. Librarians in PALNI schools work closely together on shared projects, but meet only one to two times a year in person. Camp RIO provided an opportunity to not just share professional ideals but to grow closer together as a peer group.